Ballpark Estimate: 1,000 to $3,000 a month. Where do you plan on living when you retire? If you’re like most people, you probably want to head to Florida where you can enjoy a sandy beach, hot sun and surf twenty-four/seven, fifty-two weeks a year. But if you’re looking for something completely different; a place where the Bohemian lifestyle was practically invented, then considering selling the house and moving to Prague. The capital of the Czech Republic, Prague is renowned as the cultural center of the now predominately united Europe. This is an ancient city of cobblestones, soaring towers and castles. Dubbed “the mother of cities,” “the golden city” and a “city with a hundred Spires,” this enclave of 1.2 million people is situated on the River Vltava in Bohemia. As you might expect of a city that has survived the centuries, it contains some of the most breathtaking and unique architectural urban landscapes in modern Europe. It is also a living museum. Located in the center of Europe with Poland on one side and Germany on the other, it is the perfect central location for those would-be ex-patriots who plan on taking full advantage of the reliable European rail system in order to tour its breathtaking cities and countryside. As for the weather, Prague is officially listed as having a “Mild Continental Climate” which essentially means it’s no hotter and colder than Philadelphia, PA. Its economy is “booming.” That however, doesn’t mean the prices are out of this world. But what is out of this world is its beauty and relaxed atmosphere of artisans, adventurers and world travelers. If ever a European city played host to an enormous amount of cultural events, Prague is it. Home to some of the most prominent cultural institutions and galleries such as the National Theatre, Library and Gallery, it is also the place for concert halls- literally, hundreds of them. Cinemas and “live music” clubs thrive here as well. They’re also cheap. For example, the cost of taking in a current movie might run you $4.00 US . Speaking of music, the annual Prague Spring International Music Festival plays host to an eclectic array of musicians and musical styles from around the globe. The Prague Writer’s Festival, the Karlovy International Film Festival and World Roma Festival are all eagerly awaited and very affordable annual events. Taking in these events as a spectator will usually cost you nothing. Some offer a pay as you eat, drink, watch or play option. Prague is also earning reputation for its eateries, be they low budget, four star or somewhere in between. Whether its sausage roasted over open coals in the middle of Wenceslas Square or a sumptuous six course meal at Allegro, which recently received the1st Michelin Star for a four star eatery in the whole of post-communist Eastern Europe, this ancient city can feed any ex-patriot well on any budget. Eating a meal at an inexpensive restaurant might run $6.00 US per person, while a multi-course meal in an expensive place averages around $30.00 US per person. Stare Mesto or Old Town represents the heart of the city. It’s a place where 11th century Bohemian, Baroque, Gothic and even Art Nouveau architecture thrives. You’ll find the famous Astrological clock tower here as it presides over a cobblestoned Old Town Square that’s filled with bistros, quaint shops, cinemas and cafes. Old Town Square is also the gateway to the romantic Charles Bridge that spans the Vltava into the Mala Strana district. While buying a home here can run in the hundreds of thousands in U.S. dollars, you can rent a one bedroom apartment for anywhere between $600 and $900 US. A bargain when compared to the thousands you might spend in rent in comparable European cities like Paris or Rome. Mala Strana or Lesser Town is based at the foothills of Prague Castle and is generally considered to be a calmer place than the bustling Stare Mesto. The cost of purchasing a home is a little less than the Old Town and so is the cost of renting an apartment. A one or two bedroom apartment might go for $700 to $1,000 US per month. Nove Mesto or New Town, is not necessarily new considering its establishment in 1348. But it is where you’ll find the world-famous Wenceslas Square. What makes the place “new” are the many commercial shops, banks, restaurants and hotels that line its boulevard. Real Estate here is pricey as the townhouses and apartment buildings generally appeal to a clientele that can afford luxury prices. Figure somewhere between half a million and a million US dollars for the purchase of a townhouse and $1,200 to $2,000 US to rent a one or two bedroom “luxury” apartment. Like many post communist countries that have had to deal with privatizing what was once a universal all-expenses-paid social health care system, Prague has had its share of troubles. However, with the introduction of a new Health Care Minister in 2005, the cost of private health care has become more stabilized and affordable. While the cost of medications are generally less than those in the US, the quality of health care although affordable, is not yet up to the standards of its Western European neighbors. Quality however is increasing everyday in direct proportion to Prague’s popularity as a tourist and ex-patriot living destination. The typical cost for individual private health insurance is around 1000 CZK per year or about $61 US. Another bargain. But like all things in Prague, it too is on the rise. Like any large metropolitan city of more than one million inhabitants (not counting tourists), it is generally a good idea to leave your car back home in the States. In doing so, you not only avoid the cost of auto insurance, but you won’t find yourself having to pay for garage space. And then there’s the problem of competing with the daily European gridlock. The good news is that Prague’s transport system, Prague Integrated Transport (PIT) is not only very reliable, its comprehensive network of buses, trains, trams, metros, taxis and even ferries covers both the entire city and most of the surrounding outskirts. You can purchase a common ticket or “pass” from Prague Public Transport which will allow you unlimited use of any transportation method you choose. The cost of these annual passes generally run around $220 US. Compared to popular European cities like Paris, Florence or Madrid, Prague remains an inexpensive place to live from day to day. 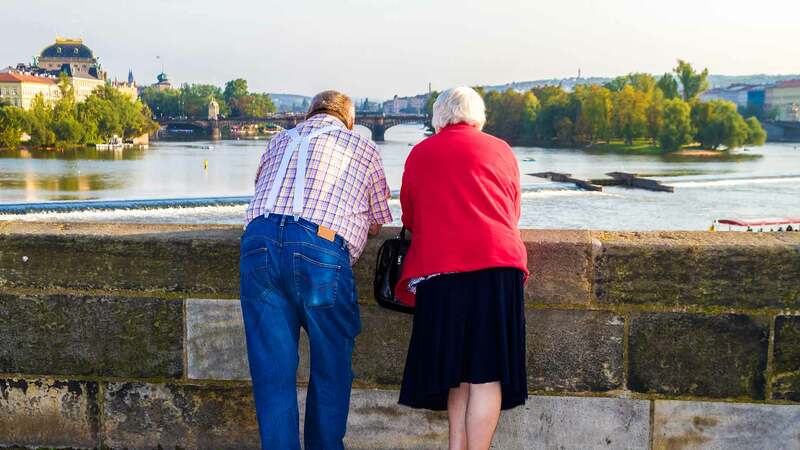 Until the Czech Republic enters into the European Union in 2012, it should remain affordable for even those who wish to retire to the city even on strict budget. So how much can you expect to spend on food, groceries, drink, cell phone, clothes, restaurants and the like? Anywhere from $300 to $600 US a month depending upon your tastes and habits. So How Can You Become a Resident of Prague? The first thing you want to do is place a call to the U.S. Czech consulate. They will offer advice on obtaining the necessary visas and paperwork. You then might want to contact anyone of the growing number of real estate businesses springing up all around the city. Simply type the key words “Living in Prague” into your favorite search engine and then select which company best suits your present and future needs. It’s also a good idea to place a call to your accountant to inquire about advice on payment of taxes in both the U.S. and Prague. If you plan on maintaining a residence in America, you’re still going to have to pay Uncle Sam your fair share. But as a resident of the Czech Republic you’ll also be expected to give the Czech government its due. But considering the overall affordability of this European jewel, paying a nominal amount of taxes is well worth the expense. Prague is a city of artistic riches, architectural mastery and inexpensive luxuries. In a word, it is artist friendly. It is a foreign destination where ex-patriots, bohemians and retirees can begin a new adventure outside the realm of the usual and the expected.